Now I realize this may seem a bit odd that I am soooo excited about a few shelves, but let me tell you that for the past few weeks, I’ve been working in chaos. (Who am I kidding, it always seems to be chaos around here, but this was beyond chaos even for me!) So, after debating what to do first in my new office, paint? furniture? window treatments? I decided to go a different route. Storage! 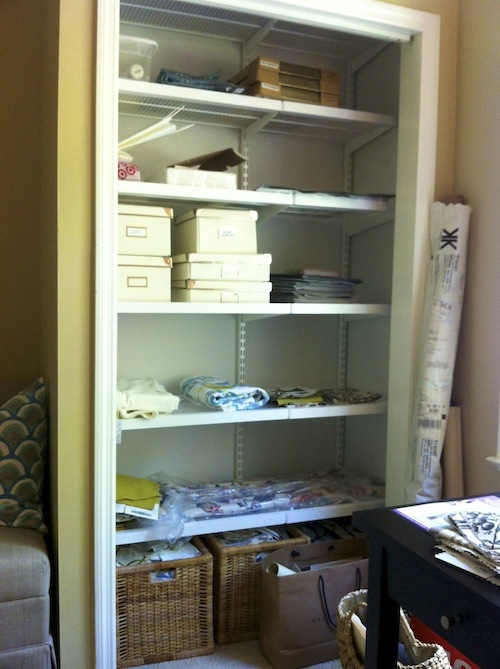 After a painless trip to the Container Store, JD arrived this morning to install these beauties in my office and in Kate’s closet upstairs (more on that later). Yes, we did pay extra to have them installed, but before you judge, know that it’s these small things that keep my marriage in tact. It took JD 4 hours of silent construction to install everything. Let’s just say, it would have taken much longer for Eric and I to do this together and it would not have been pleasant or silent. Now, as I sit here writing this post, for just a moment, all is right with the world. No, everything is not in the correct spot and there’s a ton left to do, but for just this moment, life seems a bit less daunting and I feel that ever fleeting calm. My absolute favorite part of the space. The photos are simply stunning. 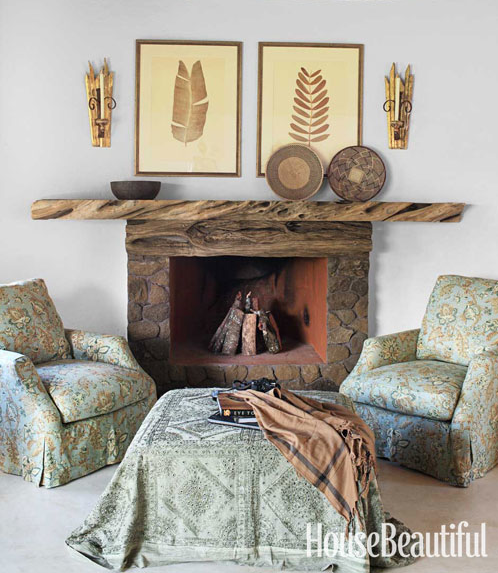 Have you seen Suzanne Kasler’s latest project in the new issue of House Beautiful? It’s in Kenya. Can you imagine that phone call? Hi Suzanne, we’d like for you to do a project for us…in Kenya?? Now, of course, I realize that many interior designers complete projects all over the world, but the logistics of this one seems a bit more daunting. 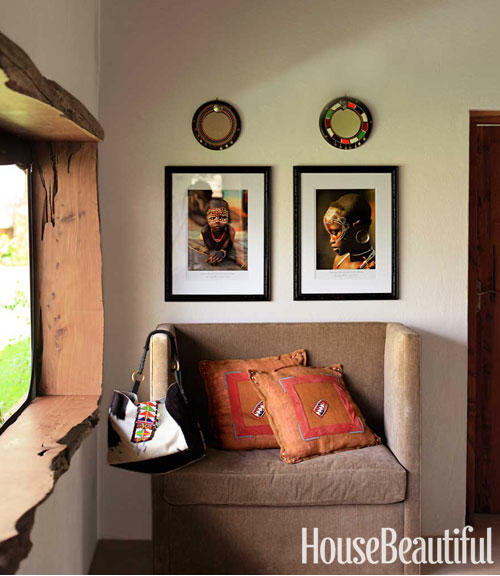 Not for Suzanne Kasler, in her classically refined style, she has transformed this cluster of huts into a beautiful, relaxing home for an Indiana couple. If you have seen these photos, bear with me, I just had to share these with those of you who may not be HB subscribers. I love to study other designers work and this one is a classic example of restraint in design. Less is so often more. Let’s see what we can learn from this project. This project could have been taken quite literally considering the setting, but the materials chosen were soft and relaxing, no hides and overpowering leather pieces here. 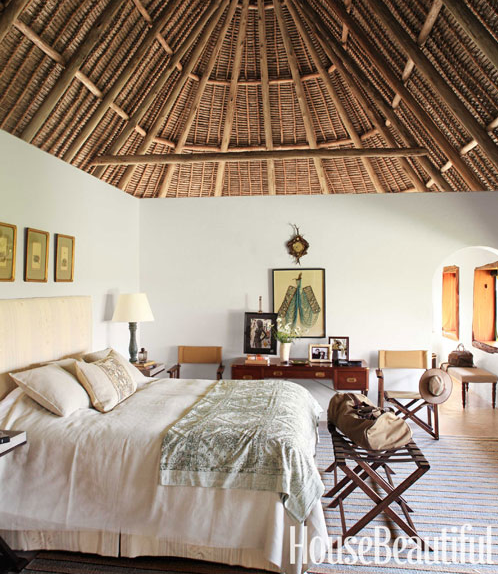 The textures are so wonderful in the entire space, but especially here in the bedroom. 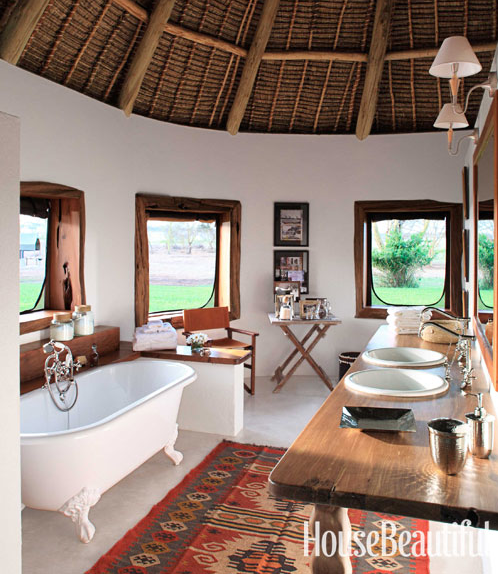 Very reminiscent of those fabulously over the top safari tents. Love the touch of blue as well. This is the master bedroom sitting area. The mantle is stunning. There is no need to cover every space on your mantle, 3 pieces are sometimes enough. Any more would be distracting. The focal point becomes the beautiful chairs in their vintage floral fabric. 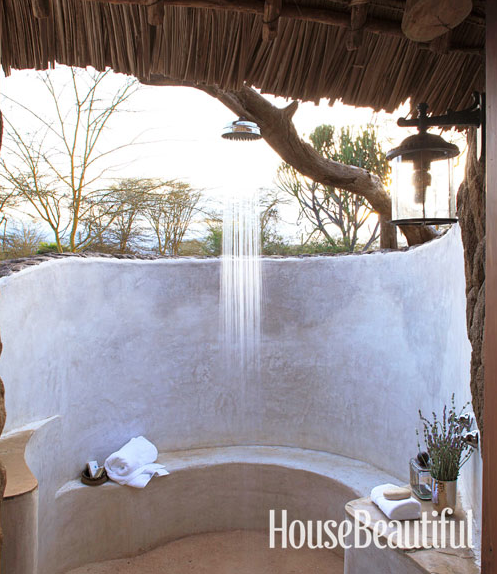 How about this for a outdoor shower? What a view! These are the outside shots. The home is completely open to the outside. It’s amazing, but I have to say that these are some brave homeowners. 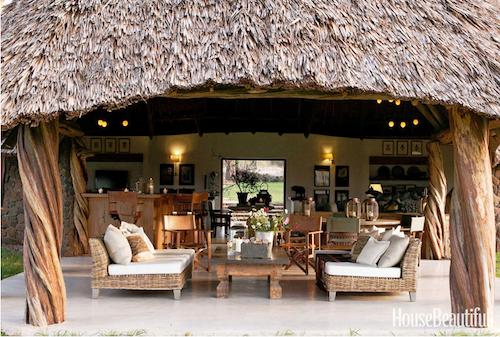 They are able to watch elephants, zebras, and lions wander by the completely open floor plan. 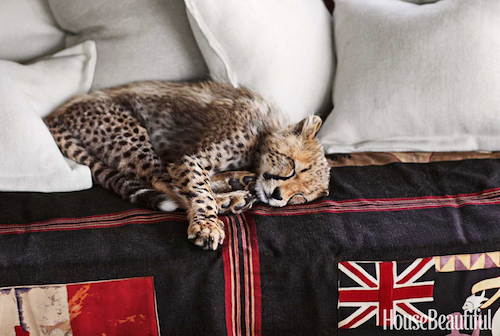 How would you like to come home to this little guy sleeping on your sofa? In this home, this could be a daily occurrence. 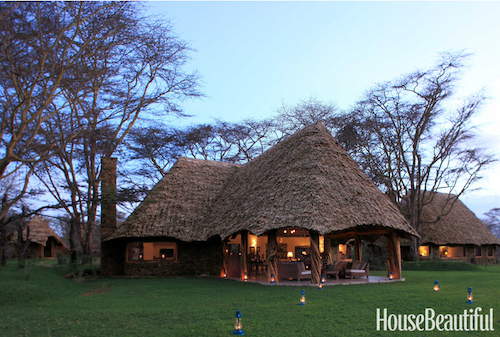 I hope you enjoyed the tour of Suzanne Kasler’s Kenya project. 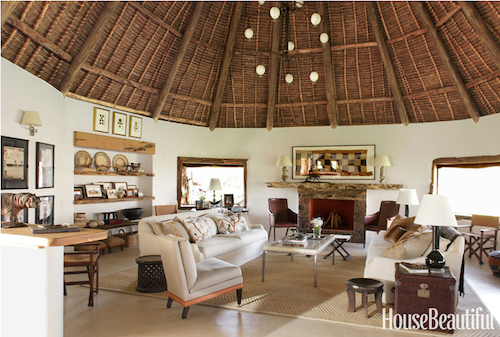 For a great interview with Suzanne about this home, head over to House Beautiful.